Site:Tad Gormley Stadiumlocated in New Orleans' City Park. The track has an 9 lane, polyurethane surface. All runways, including the javelin, are synthetic. Maximum of " spikes are allowed. Entry Fee:The entry fee is $65.00 per team if postmarked prior to March 19th. The entry fee goes up to $85.00 per team if paid after March 19th. . Boys and Girls are considered separate teams. The entry fee is $15.00 per athlete if a school is entering four or fewer athletes per gender. School check, personal check or money orders are acceptable and should be made payable to the Track & Field Meet Productions. Please print and return the2019 Registration formwith the entry fee. Entry Procedure:Entries must be submitted online viaDirect Athleticsbetween 8:00 AM CST on, Saturday, March 16 and 8:00 PM on Tuesday, March 19. Go to www.directathletics.com for instructions. Entry Limits:Louisiana High School Athletic Associationrules state that an individual may compete in a maximum of four (4) events. This can be any combination of field, running or relay events. Each school is limited to two athletes per event and one relay team in each of the contested relay races. No "B" teams/individuals are allowed. Entry Deadline:The deadline to submit/change entries toDirect Athleticsis Tuesday, March19 at 8:00 PM CST. Prelims will be held in the 100, 200, 400, 100/110 hurdles and 300 hurdles. The winner of each heat will automatically qualify for the finals. The number of remaining qualifiers will be determined by the number of heats and will be based on times. Eighteen (18) athletes in each event will qualify from the prelims to the finals. The final will be run in two heats, with the top nine times from the prelims running in the second section. 800 Meters:All but the top 9 - 12 entries (based on submitted entry times) will run in heats against time on Friday. The top 9 - 12 entries will run in one heat on Saturday afternoon. 1600 & 3200 Meters:All but the top 10 - 12 entries will run in heats on Saturday morning. The top 10 - 12 entries will run in one heat on Saturday afternoon. 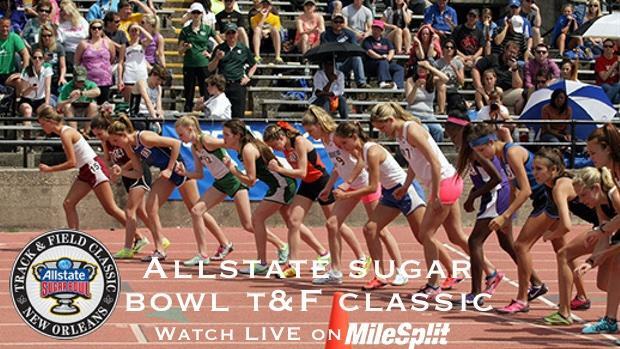 Checkwww.sugarbowltrackclassic.comon Thursday, March 21 to determine when your distance athletes will compete. Relays:The 4 x 800 relay will run heats against time on Friday afternoon. All other relays will be run heats against time on Saturday afternoon.Some coaches will be asked to serve as relay exchange zone judges. Assignments will be in your team packet. The clerk of course will be located in the South chute near the scoreboard. All running events will be clerked from that location unless otherwise announced by the P.A. announcer. Please inform your athletes of their Heat Number and Lane Assignment prior to them checking in with the clerk. Each competitor will get three attempts in the prelims. The top 10 will advance to the final and get three additional attempts. In the High Jump and Pole Vault, each competitor will get three attempts per height (or until three consecutive misses have occurred). There will be minimum standards enforced in the throws and horizontal jumps. Following the first round, no attempt will be measured unless the minimum standard has been achieved. Athletes will be allowed to jump or throw out of order in the final so as to not make other participants wait on those competing in other events. Pole Vault Girls open at 7'6' - Boys open at 9'6"
*VERY IMPORTANT*- The Allstate Sugar Bowl Track & Field Classic & VS Athletics will provide all throwing implements used in the meet. Only those implements provided by the meet will be allowed during both prelims and finals. **VERY IMPORTANT**- There will beonly twotakeoff options in theTriple Jump. There will be a 23 and a 28 board for theGirlsand a 31 and a 35 board for theBoys. These will be the only options, no additional boards will be put down. The Discus and Javelin competition will take place on the City Park practice track. The Shot Put competition will take place inside of Tad Gormley Stadium. Coaches are advised to pay close attention to the time schedule and order of events when entering their athletes. It will be difficult to compete in both the Shot Put which is held inside of the stadium and the Javelin which is held outside on the practice track at the same time. If you have an athlete that is competitive in both, it is advised that you enter them with "NO MARK" in one of the events in order to have them placed in the first flight of that event and a later flight in the other. Should the athlete make the finals in both events, it is his or her responsibility to be at the event when called to make their throws. As per NFHS rules, the athlete will have one minute to initiate their throw once being called. Awards:Custom design Allstate Sugar Bowl Track & Field Classic t-shirts will be presented to the top three finishers in each event. Boys and Girls team champion and runner-up trophies will be presented to the top two teams. Outstanding Field and Outstanding Track performer awards will be presented in both divisions. Local participating teamsmay be asked to supply one student worker to help with the track meet. These students will be asked to work a maximum of two hours, helping with field events. Teams from outside of the immediate New Orleans area will not be asked to supply helpers. Medical Attention:A certified athletic trainer will be on site for the treatment of minor injuries. Coaches must assume the responsibility for their athletes at all times and should make certain that the athletes are fit to compete. The trainer will be located in a tent located on the infield. Athletes must be dressed in their team uniform in order to be admitted free of charge. All athletes must enter through the athlete gate at the Roosevelt Mall entrance to the stadium. Louisiana coaches should use their LHSCA card for admission. Out of state coaches will have tickets in their team packets. Each team will be allowed one manager/trainer, who will be admitted on amanager/trainer ticket. Friday, March 23 - $7.00 for adults & students 12 and under will be admitted free of charge. Saturday, March 24- $7.00 for adults & students 12 and under will be admitted free of charge. Stadium parking will be available each day to both spectators and coaches for a fee. City Park controls parking, the Allstate Sugar Bowl Track & Field ClassicDOES NOTcontrol parking. Buses will not be allowed to enter the stadium gates, they must park on Roosevelt Mall.